ECAC fans are in for a real treat this coming weekend. While the quarterfinal round typically produces some interesting matchups, this year has produced four very intriguing combinations, none of which should be completely open and shut cases (although there are some distinct favorites, as always). Gary put together the matrix for the semifinals in Lake Placid. The highest seed and the lowest seed play each other in the early game on Friday, March 20 (the first day of spring), the middle two seeds play the nightcap - the concept being that the highest seed would have a little more rest before the title game on Saturday. In case you missed it last year, there's no more consolation game. Losers on Friday go home. The quarterfinal round goes to chalk more frequently than the first round does - it has happened five times out of the 12 seasons under the current playoff structure, including twice in the last three seasons. Only one first-round bye team has failed to advance to the semifinals in that span (yup, yup). The reasoning is simple - they're the cream of the crop, and they have the added benefit of getting a week off to heal injuries. Road teams in the quarterfinals have won just 10 of 48 series to date (20.8%). 20 home teams have swept (41.7%). Only 4 road teams have swept (8.3%). KRACH: Quinnipiac 12th (226.3); Union 32nd (110.4). Since February 1: Quinnipiac 5-1-2; Union 5-5-0. This may well be one of the most interesting 1 vs. 10 matchups you will ever see, and it's rooted almost entirely in the fact that Union won the national championship last year and just took Cornell behind the woodshed. The Jekyll and Hyde act that the Dutchmen have been putting on pretty much all season turned again over the last two weekends as they spiked a five-game losing streak by turning it into a four-game winning streak, and doing it against some of the same teams against which they'd just lost. They're starting to look more like the team that went on a long run to national glory last year - just after looking a lot like a team that was finishing 10th in the ECAC. Quinnipiac, on the other hand, has been remarkably consistent all year long. They saw a nine-game unbeaten streak snapped on the last day of the regular season (in a game that really only had national tournament implications), they won 14 of 18 games in a row from the beginning of November through mid-January. Their only major hiccup since the New Year was in being swept in a home-and-home weekend against Merrimack - their only overly questionable loss in league play was to Clarkson, and that was in Potsdam. A top defense and a top-end offense has made the Bobcats tough to beat all season long. When they're playing well, Union can produce similar results. That's the kind of play Union needs to get if they're going to get a crack at defending their ECAC title in Lake Placid. If they are uneven at all, Quinnipiac is a team that can take advantage of that in a hurry. Spot mistakes kill against the Bobcats, so it's incumbent upon the Dutchmen not only to play error free, but to have that same kind of killer instinct on offense that saw them outscore Cornell 11-2 last weekend - not the kind that they displayed ahead of the final weekend of the regular season, when they were being outscored 14-2 in the five games prior. Adding it all up, Union should be considered the underdogs this weekend, but not by nearly as much as you'd expect in a 1/10 matchup. Quinnipiac is in a position where they can lock up a berth in the NCAA Tournament by advancing to Lake Placid, so they've got the added motivation in that corner. But as far back as Union finished in the standings, it's never wise to count out the defending champions, especially since they've won this tournament three times in a row. Nobody on this team even knows how to lose in the ECAC Tournament - the Dutchmen seniors are 14-0 in tournament play across their collegiate careers, an impressive tally that any team, even one as strong as Quinnipiac this season, would be hard-pressed to overcome. That's what makes this series very, very intriguing from top to bottom. KRACH: St. Lawrence 26th (139.9); RPI 42nd (56.6). Since February 1: RPI 3-6-2; St. Lawrence 4-3-1. By most national metrics (national polls, KRACH, PairWise), this is by far the weakest matchup of the four quarterfinal series. It matches the lowest ranked Top 4 team in KRACH and the PairWise against the lowest ranked quarterfinal road team in both of those ratings. 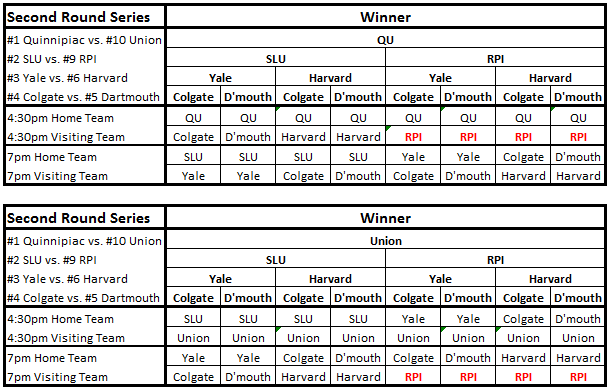 For RPI, they have to be somewhat thankful that they ended up with St. Lawrence rather than any of the other options. For St. Lawrence, the feeling is definitely mutual. This should be a matchup in which St. Lawrence has the advantage - as long as the Saints who were unbeaten in 11 of 13 ECAC contests after the New Year heading into the final weekend of the regular season shows up and not the Saints who appeared to sleepwalk through that final weekend in the Capital District, finishing their season by dropping two games to the travel pairing with the fewest combined points on the year. Kyle Hayton was the key behind one of the stingiest defenses in the entire country, to say nothing of the ECAC, but he looked beatable down the stretch, giving up three goals in each of his last three contests, and allowing four against the Engineers, who looked confident shooting on him. For their part, the Engineers are again getting good goaltending from Jason Kasdorf, who basically did what Hayton did during his own freshman season in backstopping an unheralded team to a solidly outstanding year. Kasdorf playing as well or better than he did against Clarkson is the only thing that's going to give RPI a shot in this series, considering St. Lawrence's well balanced attack. The Saints are probably going to score some goals - they were shut out only once all season - but limiting that total will be crucial for the Engineers. If they don't get goaltending, they're not going to have a ghost of a chance in this series. RPI looks to have been doing a better job of finishing on scoring opportunities over the last three weeks, but it's not going to matter unless they stay "in" games. They can't win a track meet. One advantage that RPI may have coming into this one: its juniors and seniors know how it feels to be where St. Lawrence is. Two years ago, it was RPI shocking the conference, winning games left and right down the stretch, finishing second, and having an upstart bottom end team coming into town. They know that upstart team can win. They saw it happen to them. They've played SLU tough twice this year, and with everything on the line once more, they'll need to do it again this weekend to reach Lake Placid. KRACH: Yale 16th (195.6); Harvard 20th (166.6). Since February 1: Harvard 5-6-1; Yale 5-1-2. This is a series which has a lot of potential to be the most exciting of the entire weekend. It's also got the potential to be much ado about nothing if current trends in this historic rivalry continue. Yale-Harvard has been an intense athletic rivalry dating back to the mid-19th Century, but only recently has it begun to heat up on the ice. While Harvard continues to struggle to fill their home games, the nature of the historic aspect of the rivalry helped bring nearly 12,000 people to watch the two schools compete at Madison Square Garden this year. It's likely that we'll see some more non-conference games like that one in the future as the programs look to play off that historic element. These past three seasons, however, Yale has certainly had Harvard's number. That isn't overly surprising in the past two seasons, both of which were relatively dreadful for the Crimson, but this year the Bulldogs have taken down Harvard three times, adding up to a 9-0-1 record for Yale against the Crimson across the past three seasons. That's even more dominating than the lopsided Union/RPI series before last season. Ignoring that, however, the matchup pairs two teams that, in all honesty, have been two of the very best teams in the entire ECAC when they're playing well. Both are nationally ranked. Both are firmly in the bubble for the NCAA Tournament - which makes the stakes incredibly high for both teams in this series. Toss in the rivalry aspect and you've got a quarterfinal series that is certainly going to be worth the price of admission. As their February record suggests, Yale has been firing on all four down the stretch, and while Harvard stumbled late, they bounced back well last weekend in fairly quickly disabusing the idea that Brown had a shot against them. Harvard's offense looked good and has for the duration of the season been the best in the league, but it'll have to be right on top of its game against Yale, who boasts the best defense in the nation. Yale's mastery of their nemesis bodes well for them this coming weekend, but comparing these two teams this season when they were playing at their best, one would have to give Harvard at least a chance in this one - then again, Yale beat Harvard when the Crimson were at their best, and they did it twice: after the Bulldogs' victory in Manhattan, they accounted for the only two losses Harvard had suffered to that point. Factoring all of that in, it's hard not to give the edge to Yale, but it's likely to be fun to watch no matter what. KRACH: Colgate 19th (168.8); Dartmouth 24th (157.1). Since February 1: Dartmouth 8-2-0; Colgate 5-2-1. Nothing separated the Raiders and the Big Green from one another with the exception of Colgate's road victory over Dartmouth on Valentine's Day, the sole reason why this matchup takes place in Central New York rather than on the banks of the Connecticut River in New Hampshire. These two teams bounced back well in the month of February, resurrecting what had been middling ECAC campaigns and, in league with Harvard's dismal showing for most of the month, raced each other up the league standings in hot pursuit of that last bye. More than any other pairing, this one perhaps is the best combination of two teams who have both been playing good hockey down the stretch consistently - it reminds me a great deal of the Dartmouth/RPI 4/5 pairing from 2004, which turned into a dogfight of a series, a chess match between two talented teams that both deserved to win (Dartmouth took an absolute war of a Game 3, 1-0). We would be fortunate to see something similar in Hamilton this weekend, and it's no stretch of the imagination to think that we could. Colgate is definitely on the NCAA bubble and needs wins in order to have a shot at an at-large bid. Dartmouth is realistically outside the bubble and probably needs to win the ECAC title to advance to their first national tournament appearance in 35 years. Like the Yale-Harvard pairing, that adds to the win-or-else mentality that always exists in a playoff series. The Raiders gave up just six goals in their last five outings, which included their shutout of Dartmouth in Hanover, only the second time the Big Green were shut out all year. That sentence betrays the strengths of these teams this year - Colgate's defense and Dartmouth's offense. With the lone exception being that home loss to the Raiders, the Big Green pumped in at least three goals in 11 of 12 games before scoring only two in their Game 2 win over a stingy Princeton that wasn't willing to go quietly on Saturday. It's difficult to pick a true favorite in this one - Colgate's home ice advantage doesn't seem like enough to force things to lean in their direction. The key battle is going to be the Colgate offense, which underperformed to some extent this season due to injuries, and the Dartmouth defense, which didn't light the world on fire but was strong enough to get the job done most nights. More than the reverse, whichever of these units can gain the edge on the other is going to go a long way towards determining which of two very promising teams gets the chance to extend their season and which sees things grind to a sudden - and unexpected - halt.